Leo and Mikey are shopping in disguise when two thugs attempt to rob the grocery store that they’re in. Of course, our helpful heroes aren’t going to stand around and let the theives get away with this, so they quickly put the wrap on the punks. April covers the robbery for the news once Leo and Mikey have vanished. Then the Turtle lads head for home to have some well earned pizza. Meanwhile in Dimension X, Shredder, Rocksteady and Bebop implore Krang to return them to Earth, so that they can seek revenge against the Turtles. Krang allows Saki to gate through to our planet, but cruelly forbids the bumbling henchmen a trip home. April has a run-in with her boss Mr. Thompson, who’s convinced that the Turtles are a menace to society. April storms off, determined to prove that the Green Team truly are heroes. Master Splinter gets a premonition that something horrible is about to happen… the Shredder is going to return! Sure enough, at a park in New York, Saki makes his entrance via the portal. Two hapless muggers attempt to rob Shredder, who quickly defeats them in battle. The two crooks give Shredder all of their cash and flee in terror! Saki decides to check in with Krang, who tells the nefarious ninja that he’s on his own in his attempt to destroy the TMNT. Saki decides that he’ll need a little help, so he intimidates a local karate school into assisting him. The next day at Channel 6 News, Vernon tries to impress Mr. Thompson with a story that he’s taped… but of course the story is terrible and Mr. Thompson gets angry. In his rage, Thompson orders April to go dig up the dirt on the Turtles’ conspiracy. This makes April mad and she storms off once again, all the more determined to set the record straight that the TMNT are good guys! Meanwhile, Shredder has put his plan into action. Saki forces the the Karate students to dress up in turtle costumes and rob a bank. 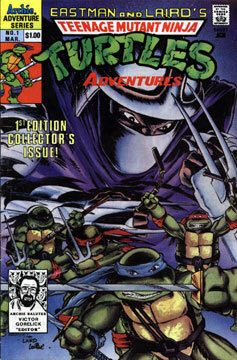 Shredder hopes that this will defame the Turtles and thus he will have his revenge. But when Saki calls Krang to report this “good” news, the antisocial alien is not pleased and screams at Shredder. Krang tells Saki not to bother him until the ninja villain has real progress to report.